Find more information about VA education and training programs and relevant application forms below. 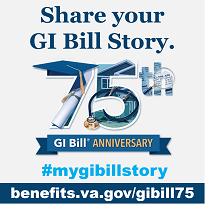 VA partners with National Military Family Association to discuss how the Forever GI Bill impacts Veterans and their families. 22-1999 These are only available to school officials with the exception of VAF 22-1999c which is for correspondence courses. This is a link to the main VA Forms page where you will be able to use a search feature find most VA forms. Mail the completed form to the Education Regional Processing Office serving your area. Here is a listing of the offices and their jurisdictions. If you are filing an application for benefits, be sure to notify your school certifying official so they can forward the proper paperwork to VA to start your benefits. Note: Forms are in order based on the form number. Sources for non-VA forms are located at the bottom of this page. Access the National Archives and Records Administration Military and National Personnel Records Center with questions pertaining to military records.